A growing number of researchers are turning to custom aptamer selection for detection of difficult targets, including small molecules and toxic compounds, and selective detection of highly similar compounds, but is it better to select for DNA aptamers or RNA Aptamers? Visit DNA Aptamers or RNA Aptamers? to learn more. Bill Jackson Ph.D. discusses aptamers and aptamer selection, the differences between aptamers and antibodies, aptamer advantages, aptamer development at Base Pair, and data for a wide range of aptamer-based applications in research, diagnostics, and therapeutics. Bill Jackson Ph.D. and CSO at Base Pair Biotechnologies was interviewed for an article in International Innovation, Health Partnership, the leading global dissemination resource for the wider scientific, technology and research communities. The article entitled “Apt Aptamer Technology” on page 100 of the August 2013 issue explores how aptamers are proving an effective alternative to conventional immunization and information on Base Pair’s patented approach to custom aptamer development. Specific buffers and re-folding procedures are recommended for optimal aptamer stability and performance. 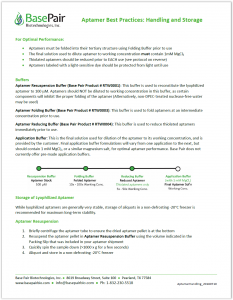 Download the Aptamer Best Practices: Handling & Storage Guide to learn more.